The saw-whet owl inhabits the forests of North America, ranging into both Alaska and Mexico. During the day, it roosts in tree cavities or holds vacated by flickers and other woodpeckers. Although the saw-whet has been known to allow people to approach it quite closely, its speckled plumage is effective in dense foliage. The saw-whet eats insects, small mammals, frogs and birds. As one of the smaller owls, it must always guard against predation by larger owls. Humans are probably the saw-whet's greatest enemy as we continue to eradicate its forest home. 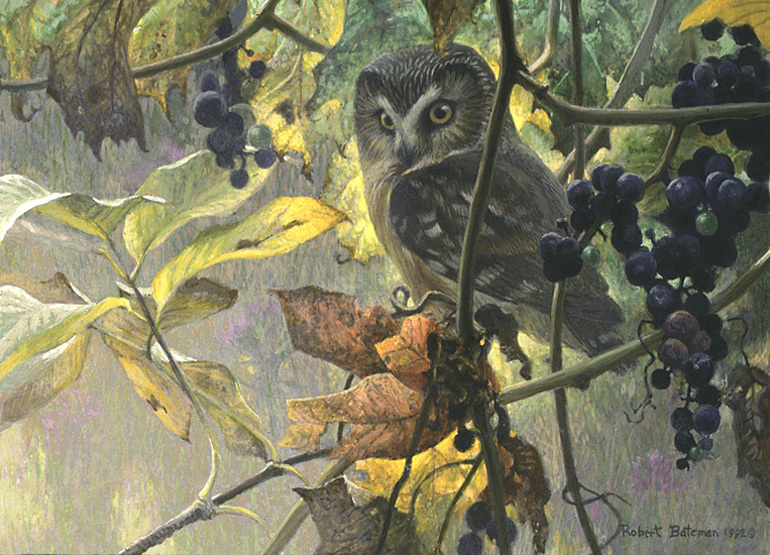 This saw-whet owl has found a hidden bower in a wild grape arbour, secure for now in a tangle of purples, greens and golds. While painting this, I envisioned the rich and lavish designs of a Tiffany lamp.